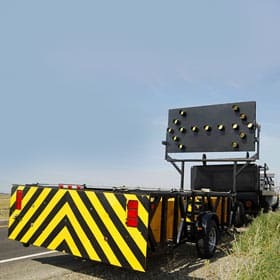 The SST is a trailer mounted attenuator for use on stationary and moving shadow support vehicles. The SST has passed all mandatory and optional testing and is NCHRP 350, Test Level 3 compliant. The SST TMA helps to absorb rear-end impacts at speeds up to 62 mph. The SST TMA is comprised of two lightweight aluminum cartridges contained in a steel support frame, heavy-duty Torflex® axle and wheels with anti-rotational dampeners, which lock upon impact. It attaches to a standard minimum 8-ton pintle hook with additional mounting brackets for the anti-rotational dampeners.